Yesterday I drove to Charlottesville and I wanted to see if the leaves were starting to change colors. I had checked the weather forecast and saw that it predicted rain for the afternoon. Yet as I was driving it started to rain in the morning and it was generally gray and misty all day. But after I realized there wouldn’t be any sunshine I decided it could still be an interesting day. The scenery was actually more dramatic accompanied by the rain. 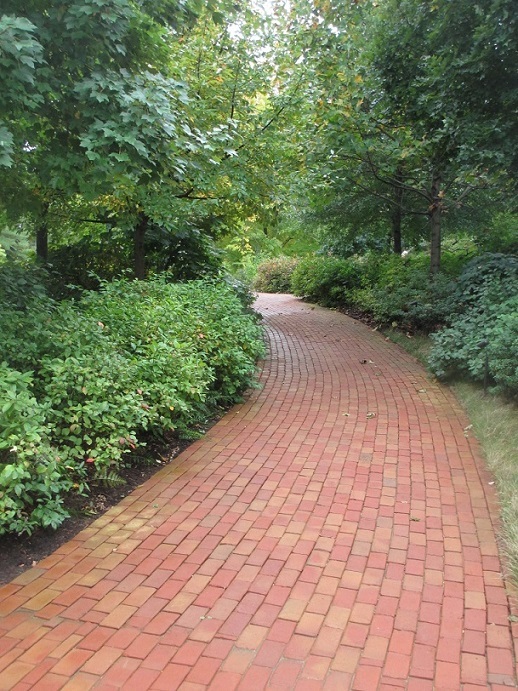 I thought that it looked dreamy and it was fun to imagine where this path might lead. I’m sure it was a path to adventure! I even found a tree that had pretty autumn leaves. This entry was posted in Charlottesville, Travel, USA and tagged autumn, rain, trees, Virginia. Bookmark the permalink. Oh what wonders we have been enjoying the past two weeks: Maine, Massachusetts, New Hampshire, Vermont and the last week here in the Adirondacks. Your post before this one sent us off on our trip and this one sees us at the end. We too, have had much rainy weather and it has added to our enjoyment of Autumn. Nice photos. I like the second one, especially. Thanks – the leaves are still mostly green and I was so happy to see this tree with such bright leaves! 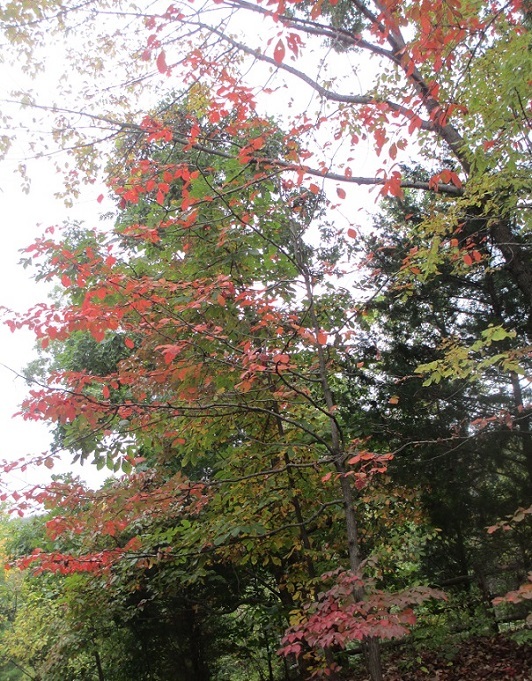 Thank you Amy – it was fun to see everything and have a glimpse of fall colors too! Thank you so much Bea – I think that your English is very good and I really appreciate your thoughts! Very dreamy. I think autumn colours are often enhanced by the rain or gloomy skies. I’ve really started to appreciate how lovely things can look in the rain – it makes everything more dramatic! And it’s even better when you remember to have an umbrella, as you do. I try to always have an umbrella handy! They are like socks or pens though. They always seem to go missing. There are black holes that eat them! That’s true – I’ve lost my share of them and then I’ll buy another new one! Colour can look more dramatic on dull days, sometimes. I think that’s especially the case in the top photo, where the mist makes the pathway glisten and beckon. That’s what I thought too – the rain really enhanced the colors! I bypassed Charlottesville yesterday to go to Swannanoah on top of Afton Mountain, about 20 or 25 miles west of the city. As a matter of fact, I did a blog entry on my post touching on my trip. After next weekend, Swannanoah will be closed to the general public until May of 2015, and given the beautiful day, it was worth taking a drive from the Richmond Area to go check out the leaves. Sadly, I should have waited a week, as Virginia’s mountain wardrobe wasn’t as colorful as I’d anticipated it would be. There’s such a narrow window between spectacular color and no leaves at all (except for oak leaves, of course). It would have been hard to beat yesterday’s weather, though, and I got lots of really cool shots (until my camera’s battery died) of the interior of Swannanoah, so all’s not lost. Small world, huh? I just wrote a book trilogy based in that area. The scene is set between Afton, Earlysville, and Covesville, with Charlottesville sitting on the outskirts of the triangle. Given the fact I was born in Charlottesville, I am familiar with the area, so anytime I see an article about my childhood home, I gotta check it out.